Anytime something shows up that I get to take out for a test and have some fun with, like the Nano Hexagon, I am always excited. 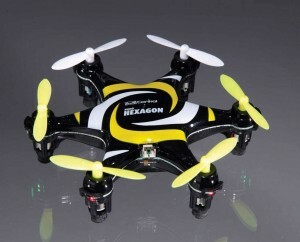 This small RTF or Ready-To-Fly hexcopter looked pretty cool and with the flip feature, it seemed like it would really add to the nano flying experience. 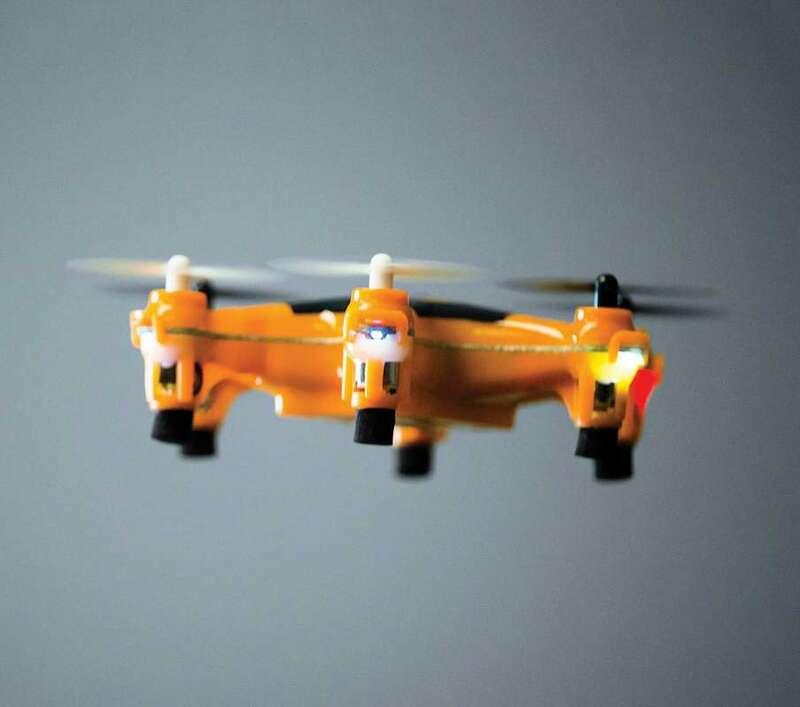 It has six motors as well as six LED lights to indicate what areas are the front, back and sides of the hex for flying in low light conditions. All we needed to get started was to install the two included “AA” batteries using a small Phillips screw driver to install them into the included remote. NEED TO COMPLETE: A Phillips tip screw driver to install the batteries in the controller. 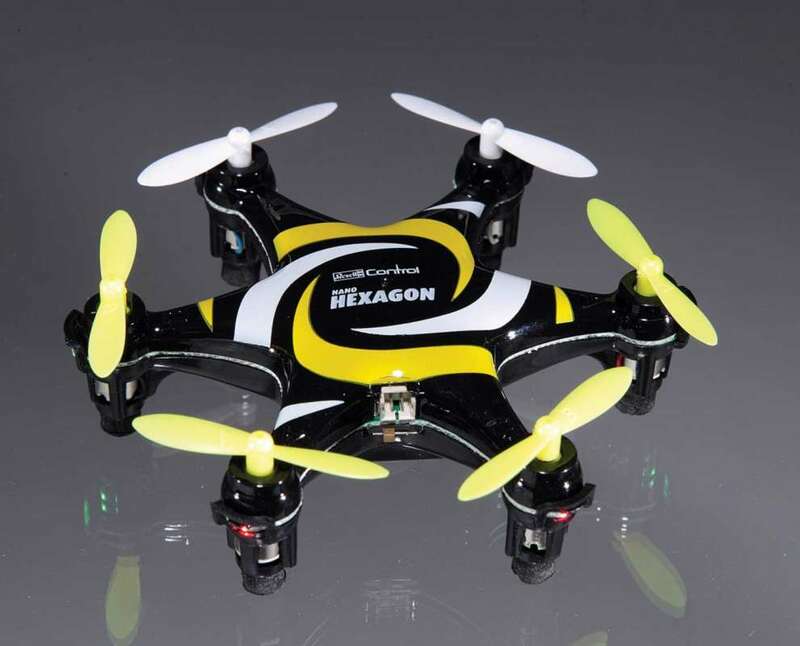 As the owner of a new multirotor, the first thing you will want to do is charge it up! Included with the Nano Hexagon is a USB charging cord. It’s very simple to use. First, make sure your Hex is shut off and then plug it into a USB port on your computer or even the wall charger for your phone. Once the charging is complete you will see the charger illuminate red. Take note that it takes up to 30 minutes to charge the battery. Next, be sure to have two fresh “AA” batteries installed in the remote. Each Hexagon should already be linked to its transmitter from the factory, but should you need to repeat the process, it is very easy. First turn on your remote and place the left stick all the way down. Next, turn the Hex on and be sure it is on a level surface. You will hear two loud beeps. Then move the left stick all the way up until it beeps and then bring it all the way down again. You will see the lights now are solid and you are ready to fly. With the Hex set and ready to fly, I gently lift edit off of the ground. It didn’t take any effort to keep it hovering nicely with minimal deviation. Bringing it up a bit higher and faster in beginner mode, it was very easy to control. In no time I was fl ying laps around the kitchen. I had a few close calls, but I was very confident in my flying abilities so I tapped the left stick in and set it to Normal mode. Now I was able to bring it up to a bit more responsive level. It was able to fly pretty quickly and stop as needed. Flying in this mode certainly made it a bit more challenging, but I wanted more. Tapping in the left stick again I now had it set to expert mode. This is where the challenge was almost too much for me. Even with the slightest touch the hex built up speed very quickly. Stopping and turning required a bit more skill, but I was able to handle it. The Hex wasn’t unscathed, however, as I did fly it into the couch a few times. On the last time I did bend a prop. Luckily Revell included a bag of extras labeled A and B. Simply pull off the old blade and press on a new one and you’re back in action. Be sure to replace your blades with the correct one or it will not fly. Once I had it back together I set it back to Normal mode and immediately took back to the air. The Nano is a ton of fun to fly. I clicked in the right stick and it would move it in the direction I wanted it to flip. After doing a few flips in a row I was hooked. 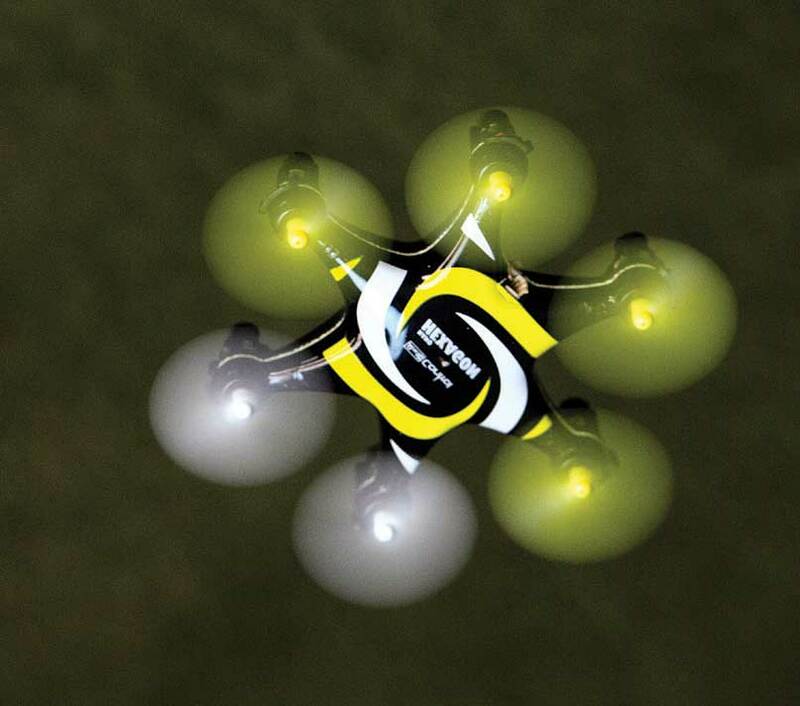 This added a whole new level to flying this exciting little drone. For pilots with other, larger multirotors this is a lot of fun to fly in the house on a rainy day. It is also a great way to learn from the comfort of your Lazyboy. After bashing the Revell Nano Hexagon around for a bit, it seems to be well worth the forty bucks. 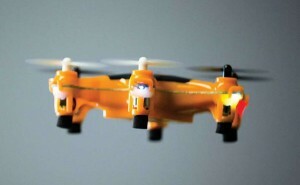 When in Beginner flight mode it is a very slow and smooth flight. 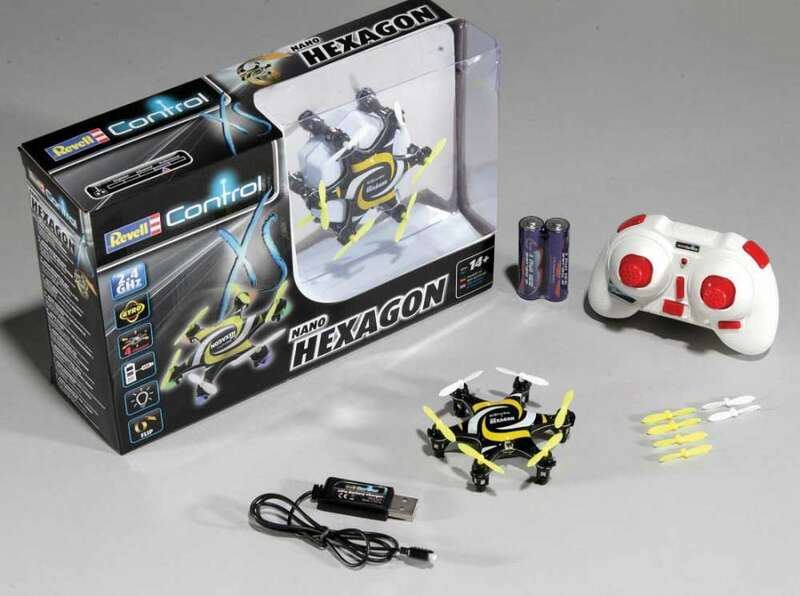 If you are looking for more out of this hexcopter, just bump it to expert mode for much more sensitivity and even some flips. It’s a good way to learn the basics of flying or to relax and kill some time for indoor fun when trips to your favorite flying locale are not always an option. I was pretty happy with the performance of this multirotor. It’s easy to get it up and going and flies very smoothly. I had a blast setting it to expert mode to work on my higher speed flying and flipping. It’s nice to be able to do more daring maneuvers with a cheaper machine than other $500+ machines. The one downside I noticed with this quad is that the blades are a bit fragile. They bent very easily when I crashed it a few times, but can easily be bent back. There are spares included and extras can be had for a few dollars so you may want to grab a few extra sets when you order your Hexagon. If you are a beginner or expert this is a good match for you. It’s a zippy little hex that’s a ton of fun flying indoors or out, day or night.